Fighting the AI, what insanity!!!!! When people talk about fighting the AI in BW, many typically think of trying to run units up a ramp, through a choke or other situations where the units can or will bug out if they aren't handled properly. However, it's also precisely because of the AI that BW will always remain the best RTS of all time. Even casuals are able to pull off amazing moves in due time. In what other game can you pull off this kind of fine maneuvering? None! A U-turn? Yep! Corsair vs scourge battles and dare I say, scourge dodging are a cornerstone of PvZ if you go for the forge FE build and decide to play it Bisu style. This is a clear example where you can abuse the AI by changing direction quickly which in turn causes scourge to stall very shortly. After all, scourge will eventually catch up to corsairs if you don't do something to increase the chances of your corsair fleet surviving. As well, who could forget one of the best RTS units of all time? And the scouts said "TATATATA! All your drones belong to us!". Another picture of the heroes! 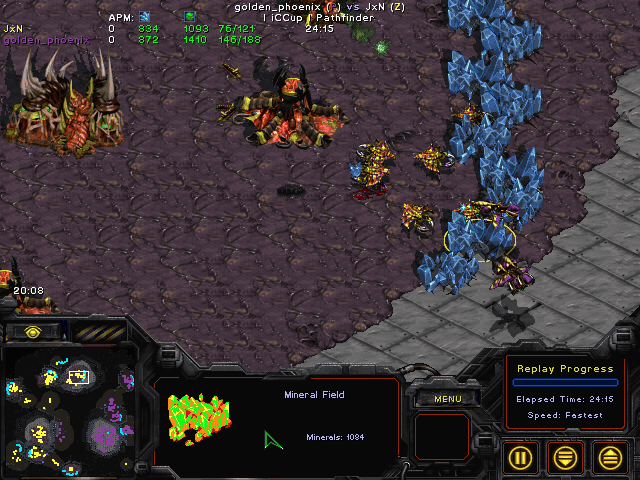 My favorite ai glitch in BW is the drone drill.. so effective for zerg and so difficult to predict as toss.. understanding and abusing these AI glitches throughout a game is 70-80% of being a good broodwar player. AND BISU'S MOUTH JUST HIT THE FLOOR, BISU CAN NOT BELIEVE WHAT JUST HAPPENED. If there's one thing BigFan is a hero of, it's of BMing. He doesn't just BM, he follows up by posting a blog *featured* blog about the BM and dedicates the OP and the first comment to it. When I grow up, I want to BM just like you. For me, I think that's one of the best BW moments ever. It was a clever use of BW AI and was just amazing. I would've probably been floored too had I watched it live lol. To your first point, you could do similar micro in Total Annihilation. Dog fights in particular were exciting. Having said that air to air missiles were guided and fighters could stop on a dime and counter attack your own. You ever slow the game down to like -3 speed in TA? You can really outmicro the computer hard. Don't fully get how the second line relates. Are you saying that even though you can pull off spectacular micro, it was diminished by the fact that missiles were guided and opponents can just stop halfway through to pull off a counter? On that note, I've never played TA, only tried the demo for it. It seemed ok, but I still prefer BW to it. I did try SupCom, but I hear that the differences were night and day. haha nice, but there was nothing BM about using scouts to win the game! Now, if I made a single scout to BM him, sure! But those scouts killed drones and denied that base from mining for a longgggggggg time! 3 scouts = Triple BM!!!111!! Well, the engines of the games are different beasts; TA had things like true line of sight, bump mapped 3D terrain. In regards to the missiles, apologies for not explaining further (was at work and couldn't type a detailed post). They are guided, and lock on to targets automatically but are not terribly agile (they can curve their trajectories). However if you micro in such a way they you can out-run them and they will lose fuel and fall harmlessly to the ground. Basically, you could in theory do something akin to the micro shown in the gif with the Corsairs and Scourge, but with regards to fighter aircraft the missiles were guided and could maneuver somewhat. If enemy planes were chasing your own, and you were tracking your units (centering the camera on them throughout) you could use stop and move micro to circle around to face them, move past them, stop again and get two shots off when the opponent might only get one. I'll try and make a video tomorrow to illustrate my point. Nah man, +10 speed all the way every day!. The amount of disrespect is unreal, and it's about to get unrealer. So you're saying that more BM = No BM? Is that why you seem to think that after you've lost 5 games of PvZ in a row and you win 1 game of PvZ your record is 1-0? You should turn that W upside down and just be BM Editor in Chief! hahahahaha you're funny! Why don't you research what quintuple means then! You've basically just quintupled Canada's overall output of bm right here. Great! Change your sig then! rofl, no can do! You still haven't proven that what I did was BM. Jesus Christ. Look at how many people are at that game. That is insane. So passionate, as well as the Bisu jaw drop. What an awesome moment in BW.